New Delhi Sep 15 (IANS) An Urdu version of the book Exam Warrior penned by Prime Minister Narendra Modi was launched here on Saturday officials said. The book was launched at a function organised by the India Islamic Cultural Centre. The event was attended by three cabinet ministers film actors and hundreds of school children. The book which was launched earlier this year already has versions in 14 languages including Hindi and English. Urdu is the 15th language in which the book has been published. Union Human Resource Development (HRD) Minister Prakash Javadekar Minority Affairs Minister Mukhtar Abbas Naqvi and MoS for PMO Personnel Jitendra Singh attended the launch along with film actors Rishi Kapoor Annu Kapoor and filmmaker Muzaffar Ali. "No one else could have written this book. Narendra Modi is the first Prime Minister to have come from the ground-level after many years....We have spent many decades in a feudal hangover " Singh said at the event. In praise of Urdu he said there are many people who are not able to read Urdu script but want to read it and for them it is not unlikely that an Urdu version written in the Hindi script may be launched in future. 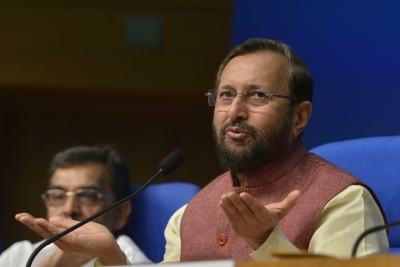 Javadekar who had recently launched the Telugu translation of the book said that it is not only for children but for parents also who unnecessarily pressurise their children during exams. The book which has 25 chapters in all with lessons on how to beat stress during examinations was distributed to all school children present there.